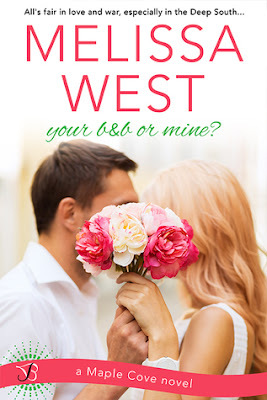 Your B&B or Mine by Melissa West is the first book by the author and I enjoyed reading this one. The lovely cover was the first thing that had me stopping to checkout the book. The blurb and title are again intriguing and had me requesting this book to read. Story of two people who have feelings for each other but got separated due to various reasons, I enjoyed travelling to a small town with its own set of obnoxious people, drama and nosiness. The protagonists are two very different people both of whom can justify their past actions but still somewhere I didnt agree with the heroine for her reasons for leaving the hero and marrying his best friend instead. Maybe it's just me but she sounded shallow with her reasons. I dont want to give away much but know that this book is full of drama, emotional play, some angst and a whole lot of second chance love. Melissa's writing style is engaging, expressive and she had me transported to a small town just as easily as if I was actually there. Loved her world building and I will be checking out her other books in the future. All in all, Your B&B or Mine by Melissa West is an enjoyable romance that will be loved by all romance lovers. 4 out of 5 to it.